The Nissan GTR is legendary in the world of Japanese Performance cars. The latest iteration is the most potent incarnation yet and Diamond Pistons' new GT-R slugs are ready for a massive 1600hp. Here's how: Among the increasingly powerful engines emerging from the Japanese auto industry in recent years, the twin-turbocharged VR38dett Nissan V6 with variable inlet cam phasing ranks as one of the most formidable. From 2007 to present the beastly little 3.8L (231ci) engine has steadily gained power until it delivers 600 HP at 6800 rpm in the current NISMO version of the Nissan GT-R. A follow on to the coveted Nissan Skyline, the GT-R has achieved considerable success in racing circles and has become a popular drag racing star. It also offers a power laden street platform for power hungry tuners once they cracked the code of proprietary engine management system. The GTR blocks are robust and they are factory configured for precise piston fit. 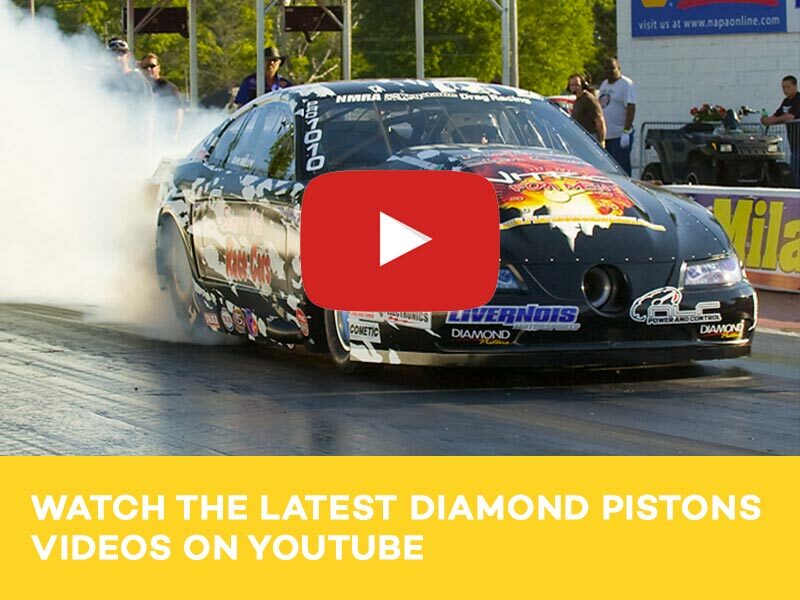 Diamond has matched the factory piston dimensions and added additional bore sizes and stroker packages. At 600 HP the engines display reasonabe reliability, but as tuners began leaning on them, piston cracking announced its presence between 650 and 700 horsepower. The factory pistons are a standard box forging that starts cracking around the pin bosses as increased cylinder pressure begins to seriously challenge their integrity. Tuners and power-hungry drag racers soon pushed these engines well over 4-digit horsepower and fostered the need for something other than one-off custom pistons for everyone who broke something. 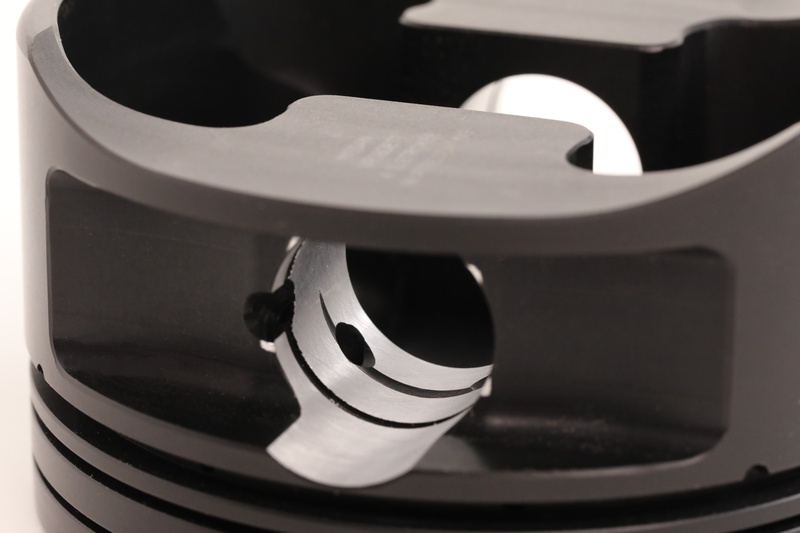 Diamond Pistons identified this need early and initiated a design program to build shelf stocking pistons with 4-digit power reliability and the ability to upgrade to the 1,600 horsepower range in selected applications. To accommodate the rapidly escalating strength requirements, they redesigned the underside of the piston to make it far stronger and they made it a full round design to help stiffen it and spread the higher loading on the cylinder walls. The full round design also resists piston slap and stabilizes the piston in the bore under high cylinder pressures to help the ring package maintain optimum sealing. The new pistons are made from 2618 alloy with very robust pin bosses and under crown milling to achieve equal crown thickness across the piston. The piston skirts are also milled and 3-D radiused. All VR38dett pistons are forged from 2618 alloy and the top ring lands are drilled for lateral gas ports. Piston crowns feature 3-D modelled valve pockets in anticipation of bigger cam profiles. They are larger and deeper to ensure adequate piston-to-valve clearance in all applications. Tool steel H13 wrist pins are standard to accommodate applications up to 1600 horsepower. They use tried and true wire locks for ease of assembly and reliable pin retention. Thicker wall pins can be specified when ordering these pistons, up to 0.250-inch wall to accommodate the cylinder pressure of 1600 horsepower. All pin dimensions are 0.905 x 2.500-inch with variable wall thickness as required. The pistons use a full Total Seal ring pack consisting of a 1.2mm steel compression ring in a 0.260-inch down top ring land far enough away to protect the rings from the tremendous heat of highly-boosted combustion. The second ring is a 1.5mm Napier style followed by a 3mm oil ring. The cylinder blocks have integral oil squirters for pin oiling and the pistons are equipped with Diamond’s forced pin oiling feature and multiple drain back ports. Horizontal gas ports are employed on the compression ring land to enhance ring seal and stability. Heavy duty H13 Tool steel pins with 0.180 wall thickness come standard and they are upgradeable to 0.250-inch for very high horsepower applications. Forced pin oiling keeps the pins lubricated at high rpm and power. 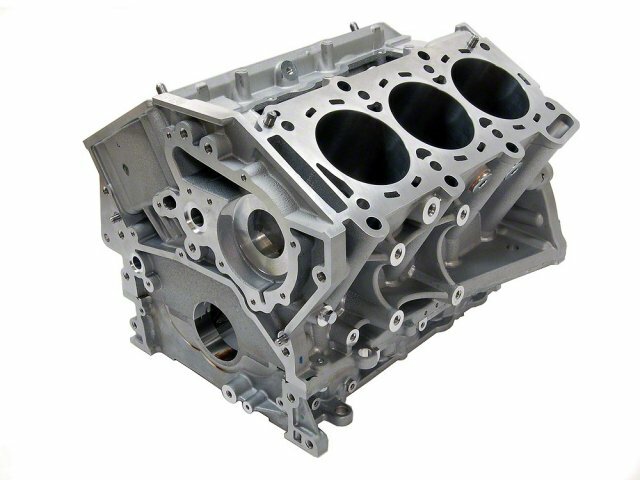 An interesting feature of the aluminum blocks is the factory standard bore dimensions called out on the top of the blocks. These dimensions specify one of three piston grades for the stock 95.5mm bore spec, so Nissan hand-assemblers can place the correct piston size in the specified bore without delay. Three grades are certified. Grade two is the original design spec for a 99.5mm bore. Grade one is 0.001-inch smaller and grade three is 0.003-inch larger. Diamond reproduces this logic with its own graded pistons to accommodate standard bores. 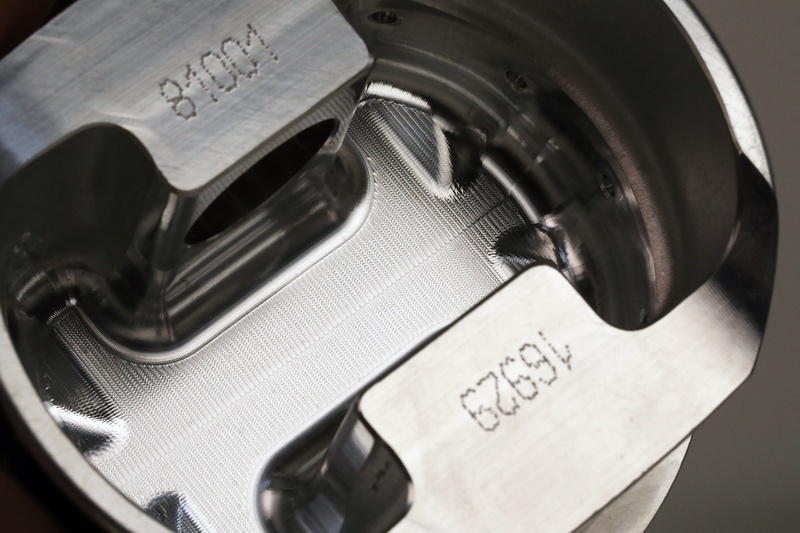 Builders can order pistons matched to the bore dimensions stamped on their blocks. For example, a builder might request a kit for grades 112123. That means he needs three Grade one pistons, two Grade two pistons and one Grade three piston. This allows Diamond to pull the right pistons for that builder’s kit. As previously noted, these are shelf stocking pistons that can be pulled in custom order as required. The catalog also accommodates bore increases to 98.5, 99, 99.5 and 100mm if required. For these applications the bores are refinished to a consistent size so only one size is required. Pistons are also available for stroke increases. Stroker pistons can be ordered in either the factory graded dimensions or the increased bore sizes as specified above. Stroker applications increase the compression ratio progressively up to 9.8:1 with corresponding reduction in pin height per stroke length. Diamond's GTR pistons feature full undercrown milling and are available in several different skirt styles and with various coatings such as moly and hard anodizing. The primary goal of this piston program was to deliver fail-proof shelf parts covering all areas relevant to VR38dett usage from stock rebuilds to 1600 horsepower monster drag engines. A key distinction is the application of additional performance features on all pistons including those destined for stock rebuilds. Hence, even a stock rebuild gains the robust piston design plus all the standard built-in upgrades such as offset pins, horizontal gas ports, premium ring package, Moly skirt coating, and other features that substantially enhance the performance and reliability of any build level. 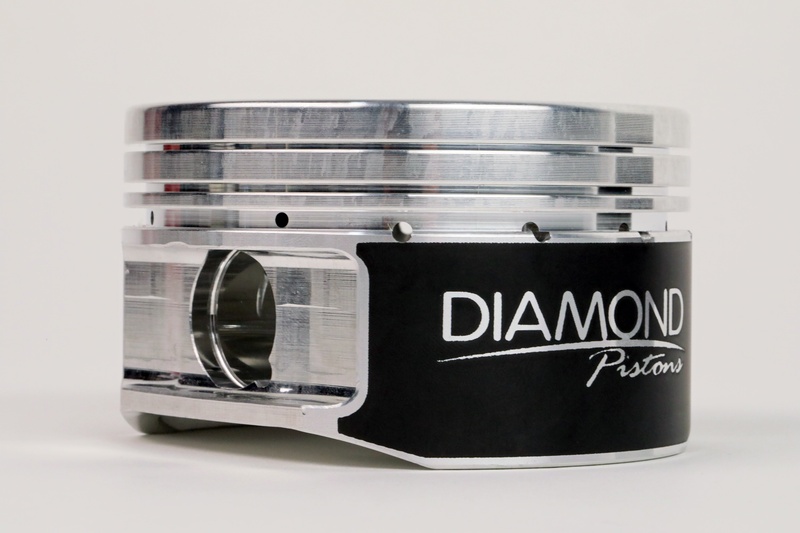 By bringing such a high level of design quality to the VR38dett piston line, Diamond has effectively eclipsed all inferior designs while providing the performance features and the superior strength and durability needed for these engines to achieve astonishing power levels and live reliably in that rarified atmosphere.